Shihan Ruriko Masutani founded Aikido of Pittsburgh in 1968 after she emigrated from Japan as a Christian exchange student. Born in Himeji, Japan, Shihan Masutani began practicing Aikido as a child in the early 1950’s under the guidance of her father. After moving to the United States and finally settling in Pittsburgh, Shihan Masutani continued training and began teaching seminars up and down the east coast. She taught Aikido in Pittsburgh for over 48 years. Along the way she has made many friends and taught thousands of students. In Pittsburgh she opened dojos in East Liberty, Squirrel Hill, Fox Chapel and finally Etna. June had a special way with people, students, teachers, people on the street, nurses and caregivers… she was always known and always loved by those she touched. Her journey in life has had Aikido and martial arts threaded throughout. 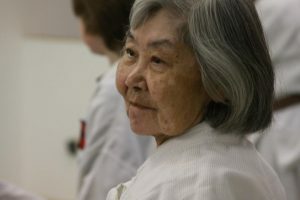 From her early years as part of the United States Aikido Federation (USAF) then a member of the Aikido of Ueshiba association and her later years as an independent instructor, Masutani Sensei always sought to give her students and friends the best, regardless of affiliations and associations. June was always a very independent person. Austere in many ways, she cut away frivolousness and got to the heart of training or relationships. She built a community in the Aikido and martial arts world that has a lasting legacy in those that she taught. She will be missed but will forever be remembered. In addition to the memorial service on Sunday June 3rd, the senior instructors of Aikido of Pittsburgh will hold a memorial Aikido seminar in her honor later in 2018. The burial will take place after that seminar. Please check the Aikido of Pittsburgh website, www.aikidopittsburgh.org, or our Facebook page for more details on the seminar and burial date.